Tennis players are always looking for that perfect match—the ideal doubles partner or across-the-net competitor who makes the game even more fun and exciting. At Reynolds Lake Oconee, the job of “matchmaker” is masterfully handled by Barbara Voyles, who has lived on the lake for 21 years and spent the last nine at Reynolds as tennis concierge. In other words, she’s the woman who marries serve and volley. The Reynolds tennis program is booming with more than 280 active members. 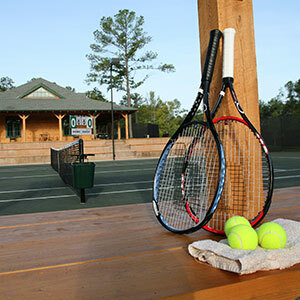 For the past eight years, the tennis center has been a Peter Burwash International (PBI) training facility, offering instruction at all levels. Whether a player is on property for a few days or lives here year-round, finding a new and well-matched partner is key. 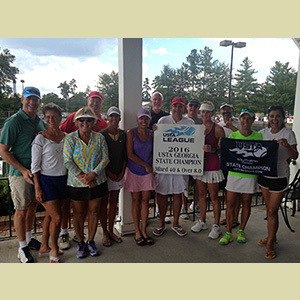 Voyles has been playing tennis for 50 years, and was part of the original group when the Lake Oconee Tennis Association (LOTA) was founded in May 2000. Since then she’s held almost every possible job, including Ladies League Director, Vice President, President, and Membership Director. Right now, she is the USTA League Coordinator. “Let’s just say that Barbara has connections,” says Neuhart. In the hands of Barbara Voyles, every game and set is a perfect match. Become a Reynolds Insider and receive notifications on new offers, promotions and upcoming events. 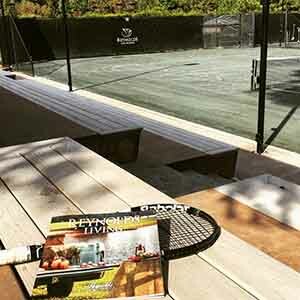 Reynolds is well-known for spectacular golf, but there’s just as much passion shown on the court as on the course.